Most amps have the ability to use an external footswitch to change between a clean and distortion channel. Of course, some have more sophisticated options than this, but the channel switch is a pretty common feature. My older brother recently got an awesome-looking, orange Fender Duo-Sonic and a small Fender practice amp to play it through. This little Mustang amp has a lot of presets and he can use a footswitch to select between a pair of them. Of course, it being an affordable practice amp, the footswitch is sold separately. But a footswitch is a pretty easy thing to make yourself. In my case, I had the double pole single throw (DPST) footswitch taken out of my Dunlop Wah pedal when I modded it (post to come someday!) and an old stereo audio jack. That, a bit of wire, and something to put it in is all you need! In fact, the fact that it was a double pole switch and a stereo jack made them both overkill for this small project! But why not recycle the parts for a good cause? 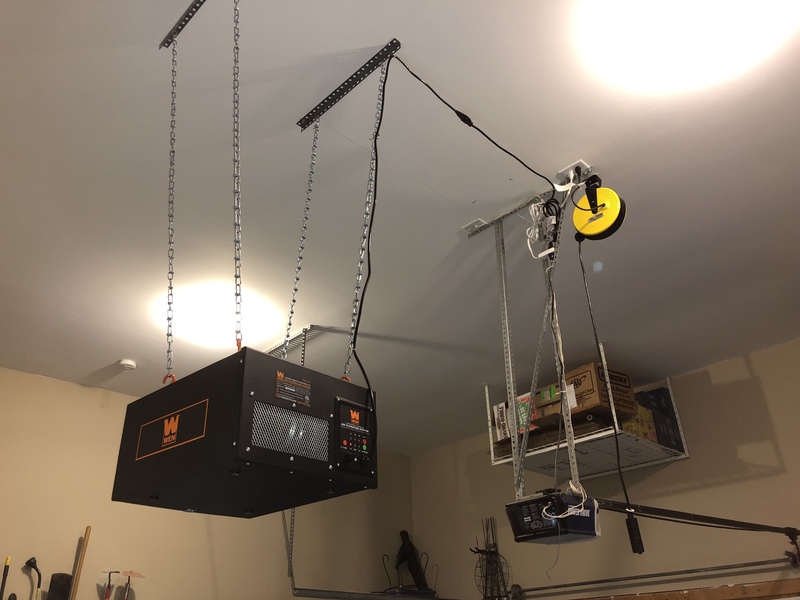 I purchased a powder-coated 1590LB enclosure from Mammoth Electronics. 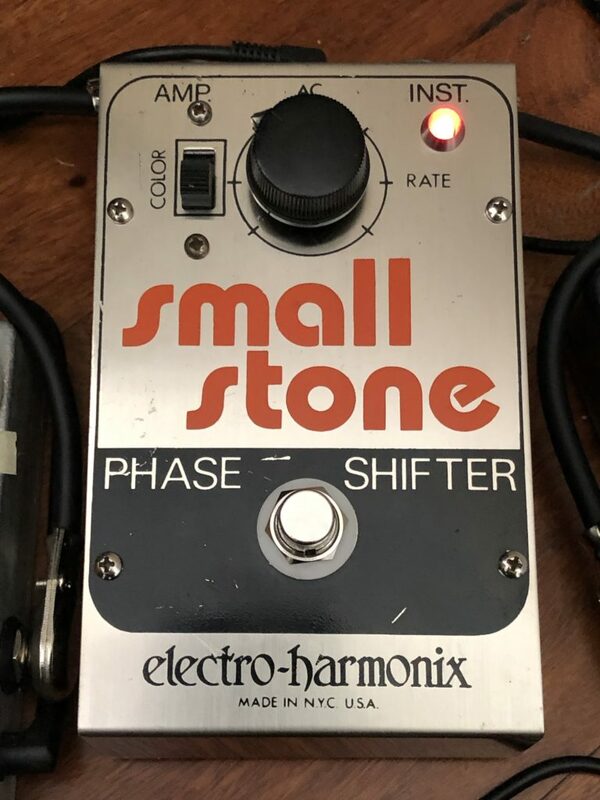 At 2″ by 2″ by 1″ tall, this is about as small an enclosure as you can get, but plenty big for a small switch and a jack. I got the orange to match his guitar (well, as close as I can get with stock powder coat colors, anyway). I laid out the switch and jack to ensure I could arrange them how I wanted; though I could have also just had the jack on the “side” of the enclosure. 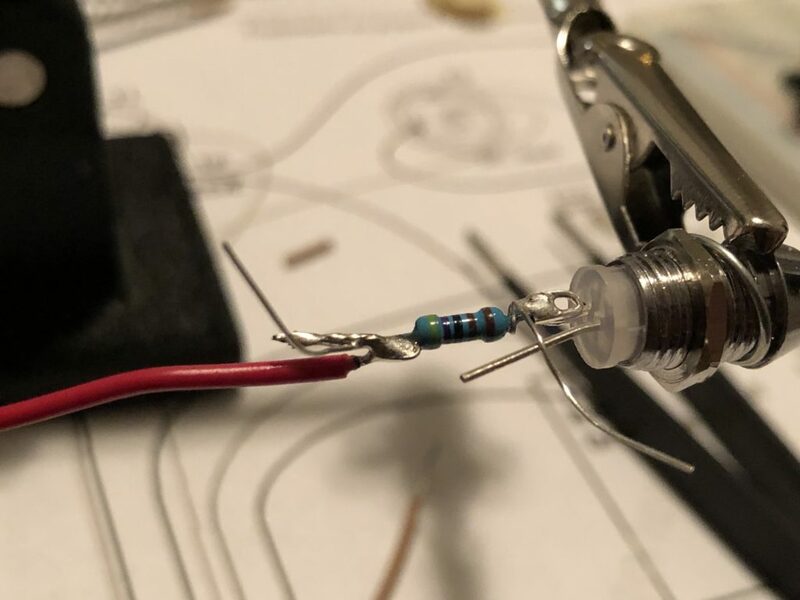 The circuit soldering here is super-simple: just solder the “tip” lug of the jack to the center lug of one of the poles (three of the lugs in a line make a pole). Then solder the “sleeve” lug of the jack to either the left or right lug on the same poll of the switch. That’s it! Did you mess up and wire the sleeve to the center lug on the switch? It’s still fine! All this does is connect the tip to the sleeve when the switch is “on” and then breaks the circuit between the two when it’s off. 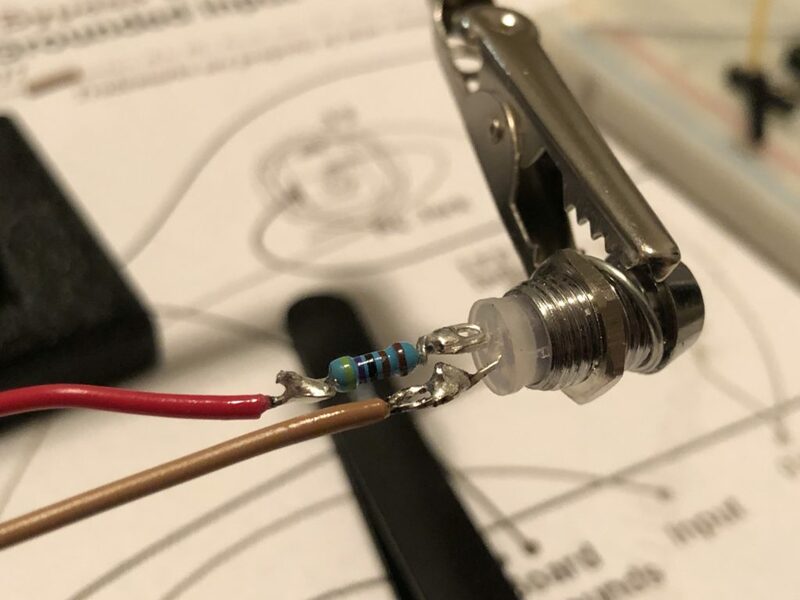 Now, this particular build relies on an instrument cable to connect the footswitch to your amp. But you don’t have to use a shielded cable for this as the guitar signal itself isn’t passing through that cable; just a relatively low voltage (around 4-5v1) is flowing through to tell the amp the gain channel should be on. So you could actually skip the jack and just use any old wire (speaker cable, a lamp cord, etc.) and wire that into a 1/4″ audio cable end. I was just using as many spare parts as I could. 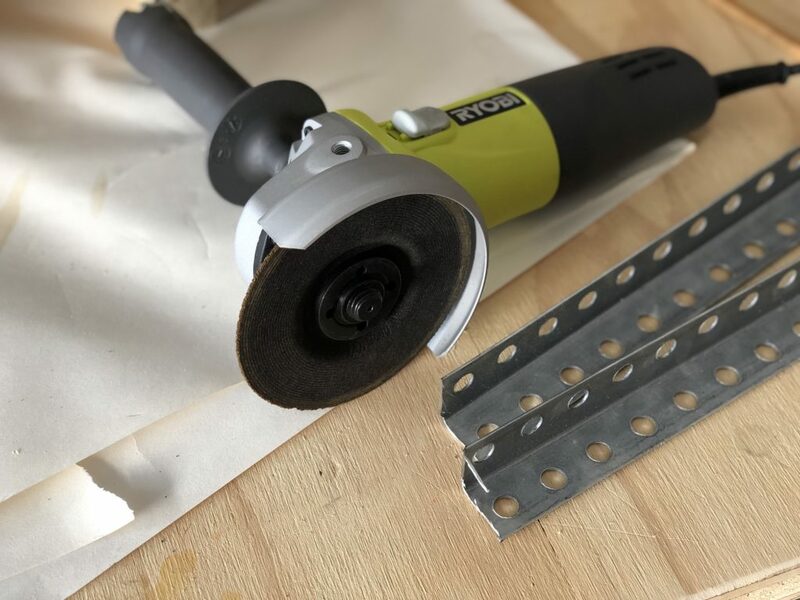 In fact, I finished the bottom by cutting up a kitchen jar grip pad and gluing it to the bottom with spray adhesive (it won’t slide on his hardwood floor!). Given that the Fender single footswitch costs around $15, this probably is not much of a cheaper alternative. But it was a fun gift for my brother and if you’re interested in practicing some soldering, this is a great and practical project to start with! 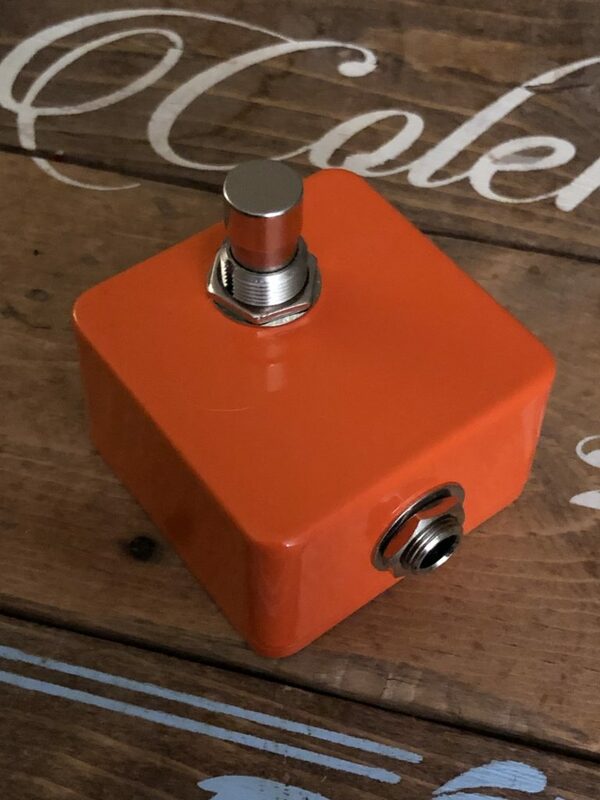 So, amazingly enough, there’s a video in which YouTube channel MerwinMusic makes the exact same footswitch as mine – down to the orange color! Check it out! 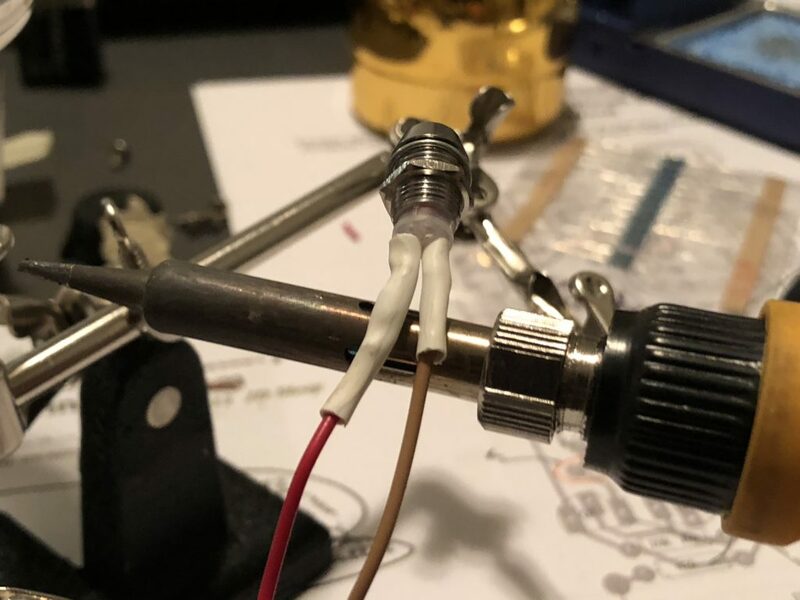 He also does a great job of explaining how to test out that this sort of switch works with your amp before you go to the trouble of building one, which is a good idea as some amps may vary (but all good amps just copy Leo’s original!). 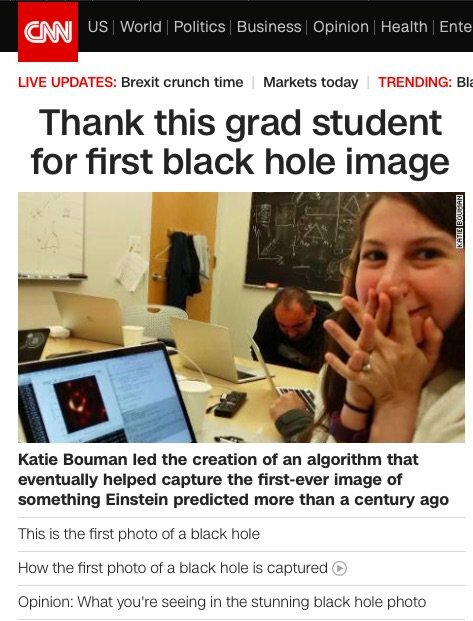 I built this exact same project almost! With each new pedal build, I try to focus on some aspect that makes it a new challenge or something new to learn. 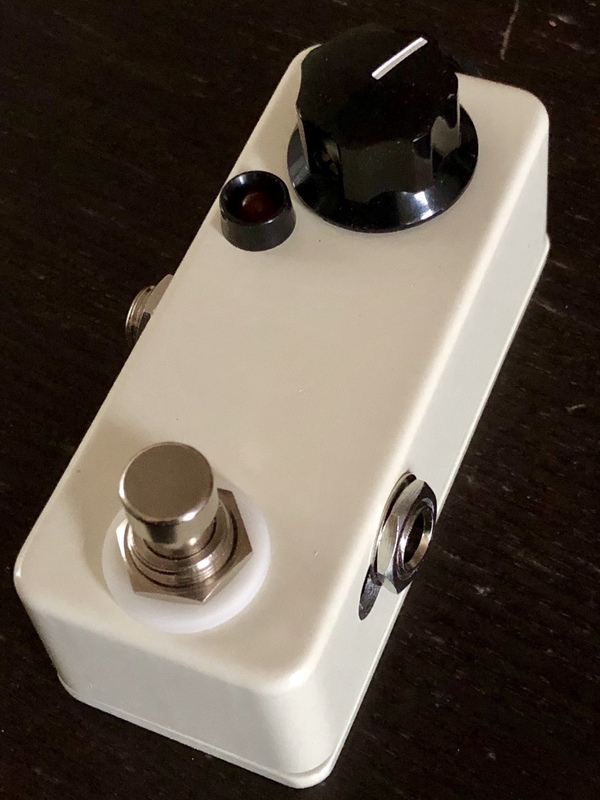 My first pedal build ever (about 18 months ago) was a boost pedal. I decided I’d build another boost: this one using the MXR MicroAmp circuit. 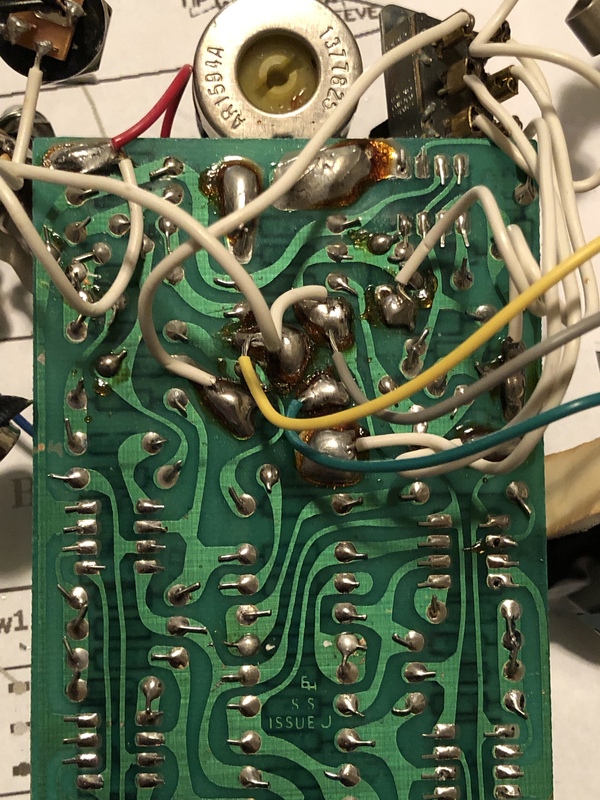 I used the General Guitar Gadgets MAMP PCB, which in addition to selling the PCB sells entire kits and has excellent documentation1. Since it’s a relatively simple circuit and, therefore a fairly small PCB, I wanted to try to fit it into a “mini” enclosure (i.e., a 1590A format). This means having to really think ahead about aspects of the build so that everything can squeeze into such a relatively small enclosure. The first thing is that this pedal format can’t utilize a battery for power; the pedal will be AC powered only. That’s fine as I don’t use batteries in any pedal anyway and only ever added a battery snap to that first pedal build. Secondly, the height of the components really matters. The taller components (generally, the capacitors) had to be bent over. 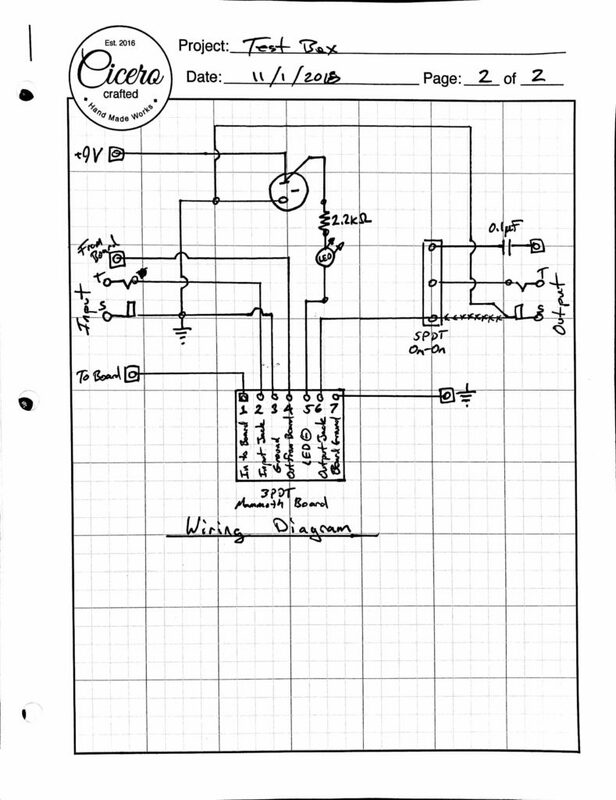 For the electrolytic capacitors, I had to remove and replace a couple in order to facilitate this (I had planned ahead otherwise – as my sketched notes on the wiring diagram shows below, but I am just so in the habit of soldering the completely vertical I forgot!). In the end, the tallest component off the PCB was the integrated circuit (IC), as it was mounted in a socket. This way I can potentially swap out ICs in the future. Speaking of ICs, I went with a low-noise TL071 op-amp (in place of the original pedal’s TLo61 – which consumes less current but, again, I’m not using a battery so I don’t really care about that). 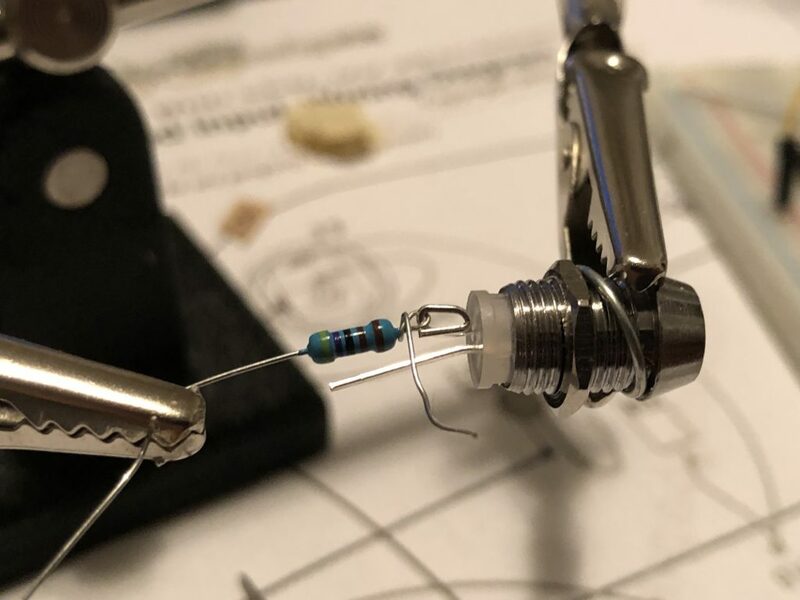 The only other modification I made to the GGG circuit was that I swapped out a 10MΩ in place of the 22MΩ pull-down resistor (R1). Really, any fairly large (<1MΩ) resistor value will do here and 22MΩ are a little harder to find. The completed wiring. This was a tight fit! Notice all the taller capacitors look like a strong wind came through. 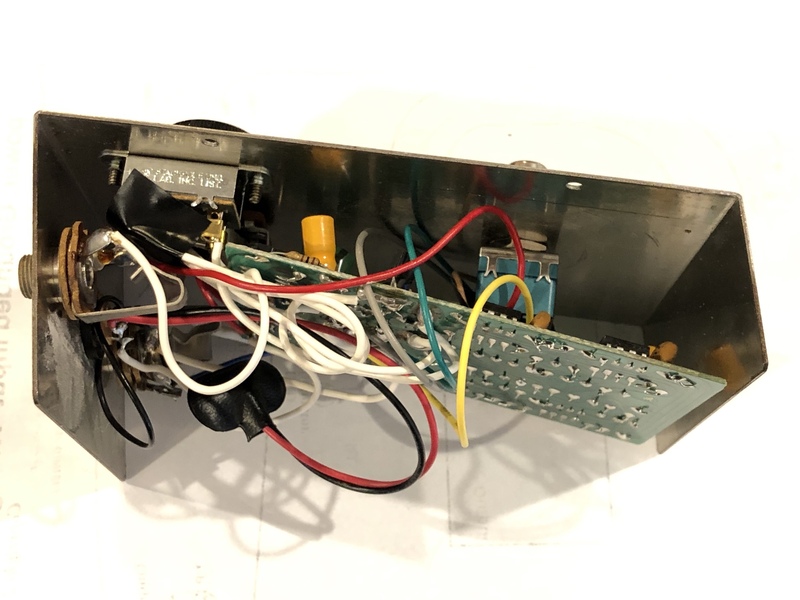 Lastly, the arrangement of the larger off-board components such as the footswitch, jacks, LED bezel, and pot really came down to millimeters. I had to use calipers to measure every last item and meticulous sketch it out on a printout of the enclosure. I still managed to mess up drilling one of the jack holes (I located it 1/2 the diameter off, which s about the worst place to mess it up!). 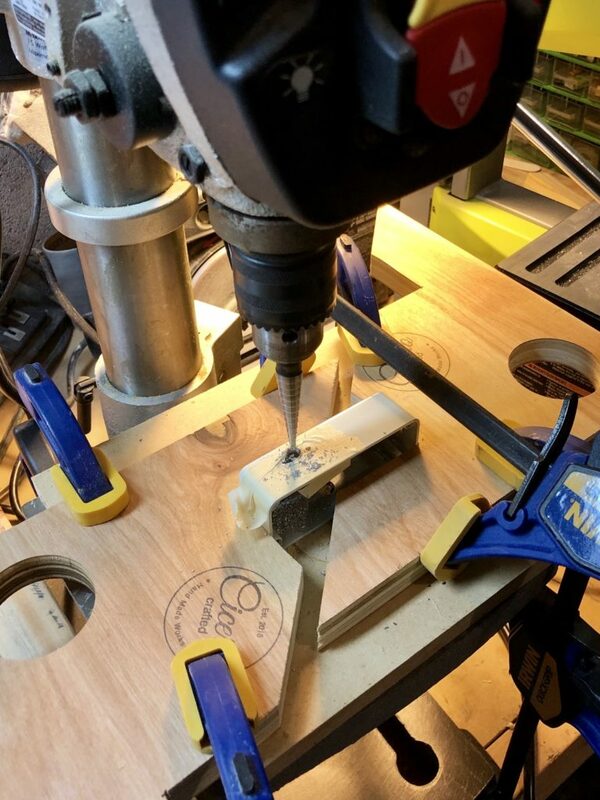 I was able to re-drill the hole thanks to having a drill press and some clamping blocks. 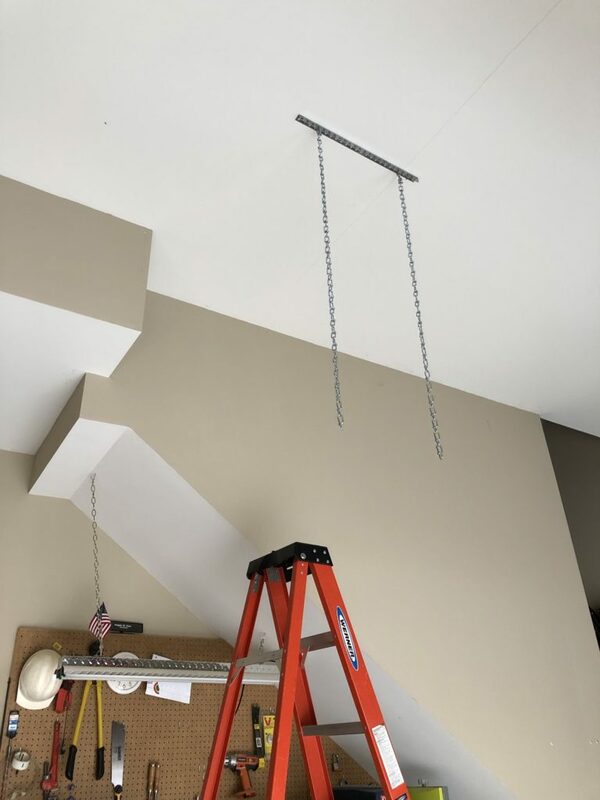 It’s a bit ugly and the jack’s nut is a bit crooked, but it worked out fine. Re-drilling a hole for the output jack. Drill press & clamps absolutely required to fix this sort of bone-headed mistake. The pedal works great. I mean, it’s about as simple an effect as you can get. It simply takes the guitar signal and makes it a lot louder (probably around the order of 20-25db). I’m pretty pleased with how clean the wiring worked out, as well. My build cost around $27 for the parts I had to purchase. That’s not including resistors, capacitors, diode, and LED (nor hookup wire and solder), all of which I already had in my parts bins but would run you around $3 in total. I also had to pay around $9 in shipping. The PCB from GGG for was about $3.50 to ship. I bought parts for several builds at once in a large order from Mammoth Electronics (my parts supplier of choice), but smaller orders from there tend to ship for around $5. They have high-quality powder-coated enclosures for really great prices, along with generally good prices on other parts and kits. So, in total, this build is roughy around $39 in cost (and I still haven’t added any artwork, so consider what slide decal or other format might cost). That being said, unless you really want to build your own, I would not recommend this build to anyone else. You can purchase a TC Electronic Spark for about $35 used on Reverb.com (plus shipping) right now. It has the exact same size as my build, but has their amazing non-latching (relay) footswitch and essentially the same amount of clean boost. If you don’t care about size, you can purchase a used MXR MicroAmp for around $49 on Reverb (plus shipping). Both of those are solid choices if you really just want a boost pedal and are less interested in practicing your soldering skills or learning how to layout a small pedal form factor. And honestly, as much as I think this pedal sounds great so far, those probably sound even better and have less noise at full gain. But overall, I’m pleased with this build. On the clean channel, it just gets louder without adding anything else noticeable. Best of all: with the knob set to about 3 o’clock, it makes my Blackstar HT-5R head’s gain channel absolutely breathe fire! I’m in various stages of completion for several guitar effects at the moment and I’ll certainly try to write a post for each of those in turn. 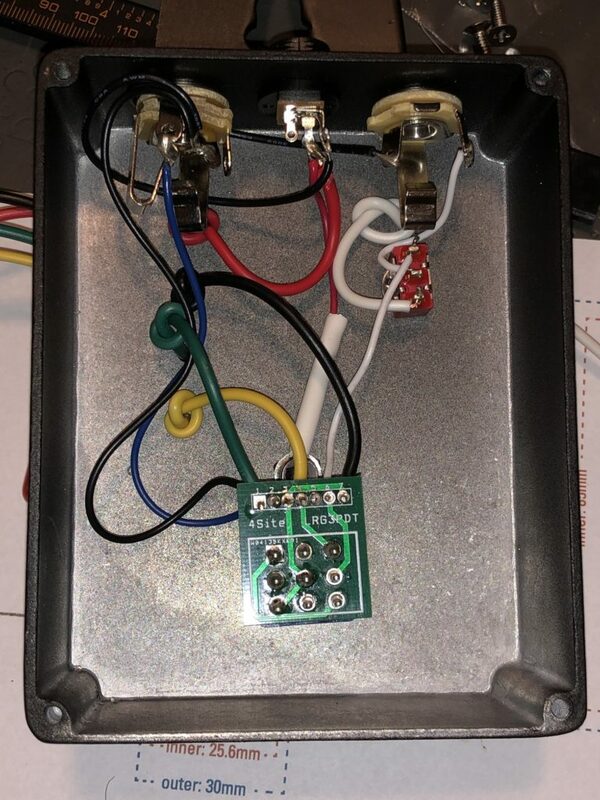 However, I first figured I should post about my guitar effect PCB test box I put together. I by no means first came up with the idea. 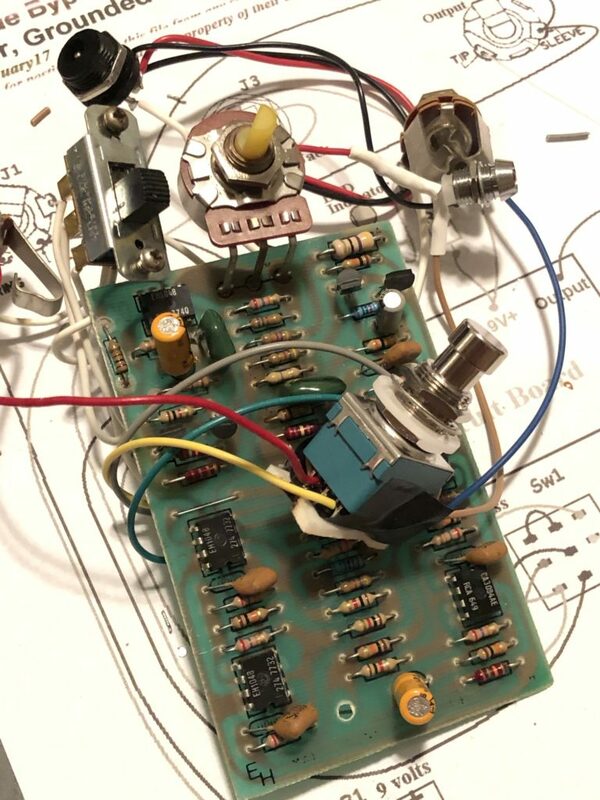 Paul of DIY Guitar Pedals in Australia is who I first saw use & recommend one. 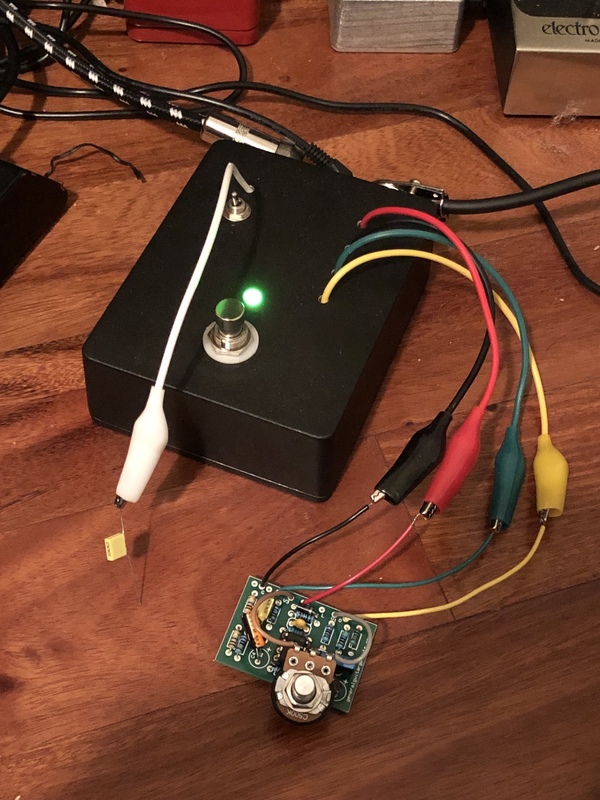 In searching around for further ideas, I came across some notes on DIY Stomp Boxes about adding the probe, which can be used in diagnosing PCBs that aren’t working. As you can see, I went with a fairly large enclosure for this project. As it’s really just the off-board wiring standard to most any pedal project, with no circuit board, this is somewhat a waste of space. However, I wanted to leave a bit of space for potentially adding some more features at some point in the future1. 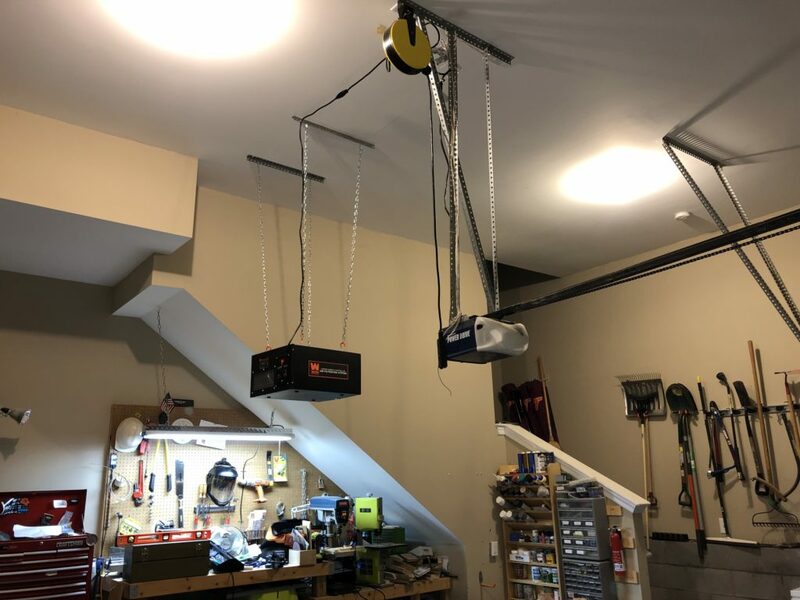 This is a powder-coated, aluminum enclosure which is not at all necessary for this, as the wiring is outside so the metal box isn’t shielding anything. So the enclosure was a bit of a splurge. But as Mammoth currently sells these 1590BB enclosures powder coated for under $10, it’s not exactly a bank-buster. The entire test box is less than $25, and many of the parts I already had in my parts bin. I cut up some cheap alligator clips I bought off of Amazon.com to use for the connectors. They have little covers over the clips, so they work quite well even when connecting into closely spaced wiring leads. I did knot these just inside the box to provide some strain relief (though it’s not as though this thing is getting roughed up much). I used a Mammoth Electronics bypass wiring board just to simplify things a bit. I tend to use a standard wiring colors for all my projects: red for 9v, black for ground, green for signal to board, and yellow for signal back from board. The one trick my box has is that I added a toggle switch to use a testing probe. This switch basically hi-jacks the signal return (yellow) and connects the probe (white) directly to the box output jack. So if signal isn’t coming back from the circuit, I can flip this switch and then use the probe (which is nothing more than a 1μf capacitor) to touch along the circuit to trace where the fault is. It’s very simple but incredibly helpful. 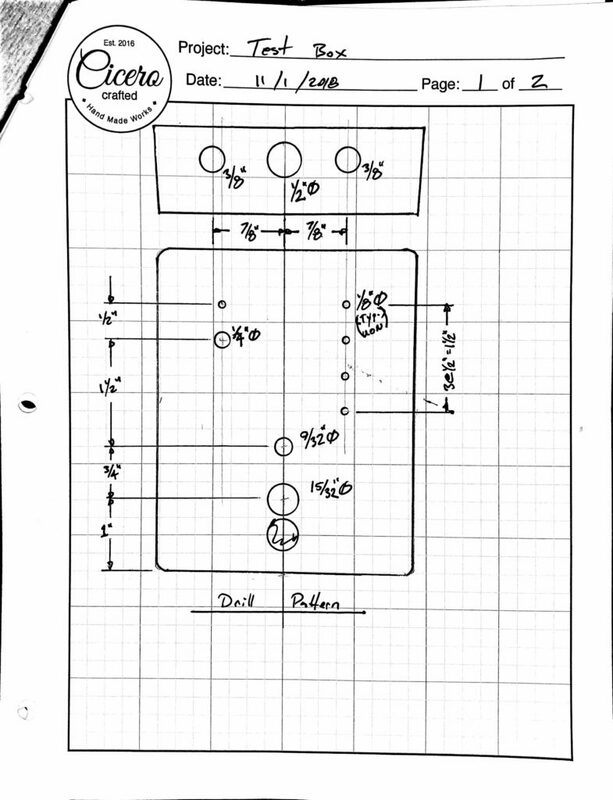 So to quote Paul of DY Guitar Effects, if you’re going to even build just more than a couple of guitar effects yourself, you’re going to want to build something like this. 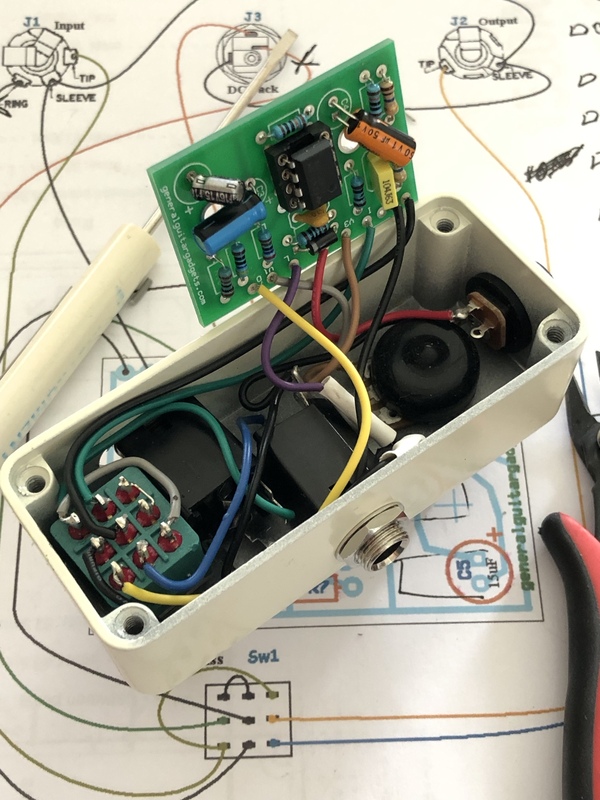 It’s so invaluable to be able to test your PCB as soon as you get the components installed but before you try to complete all the off board wiring & stuffing it into an enclosure. It’s also extremely fun to hook up to a breadboard and test that way!